I am a self-taught Carroll County wood turner, enjoying the beautiful wood that God has given us. He puts the beauty in – I get to show it off. I began turning wood in 2004, finding that wood-turning was to become my new passion. Most of the wood I turn is from the Maryland area and from trees that must come down or have already fallen. It’s hard for me to see a fallen tree on the side of the road and not imagine what could be created from that wood. I cut and haul most of the wood that I use. I also turn most of it green, meaning while the wood is still wet, which is a whole process in itself. I reside in Carroll County, Maryland, with my wife Susie. When I am not wood-turning, I enjoy beekeeping. Handbuilt stoneware architectural sculptures using the slab building method. A variety of ware includes houses, barns, fairy houses, and many other architectural styles. 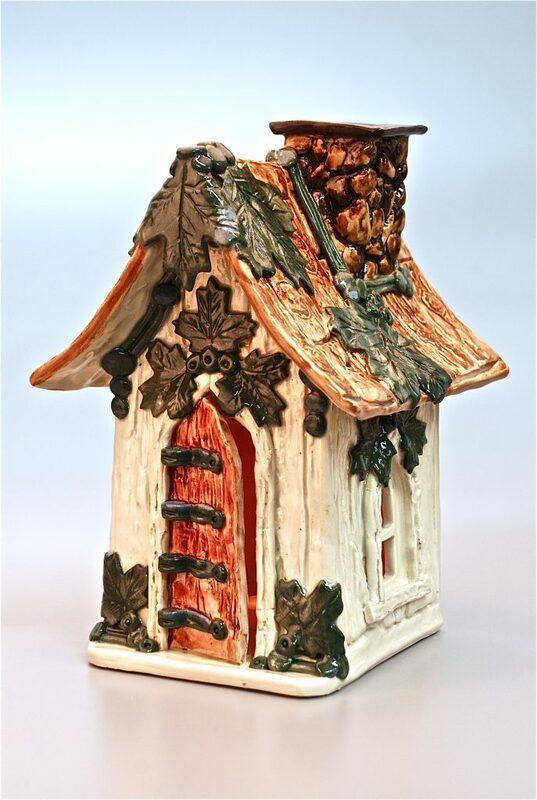 Also, many weatherproof garden pottery items such as bird houses and toad houses, and plaques. 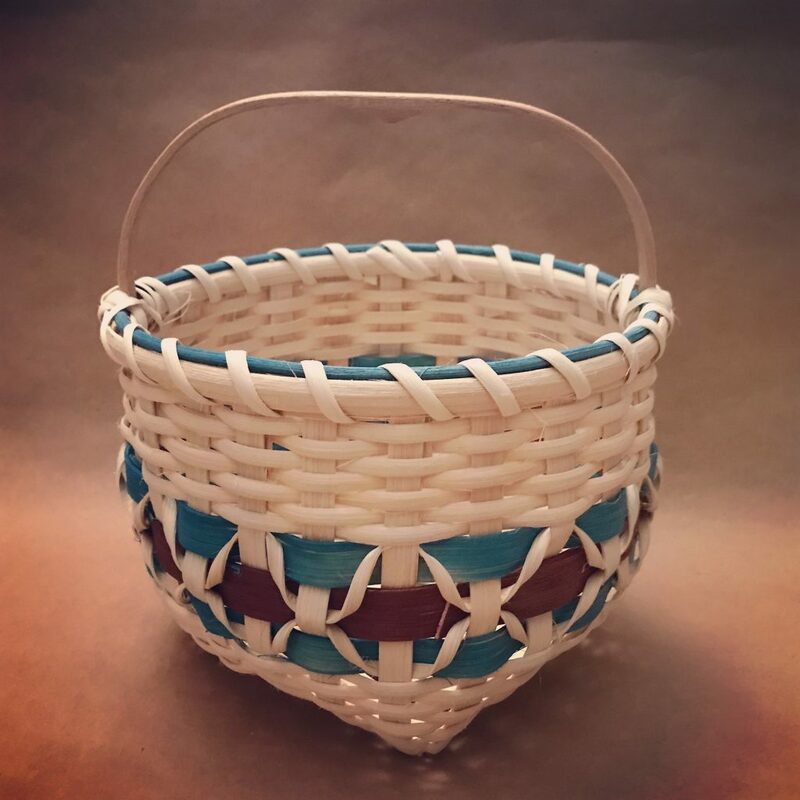 Joyce Shaum is a nationally acclaimed basket maker invited to exhibit at the Smithsonian Craft Show, Philadelphia Museum of Art Craft Show, Cherry Creek Art Festival, and shows produced by the American Craft Council. She has been featured at Winterthur Museum Conservation Program and Renwick Gallery, National Gallery of Art. She bases her work on traditional design and techniques of Native Americans, Shaker, and New England basket makers, adding her own contemporary flair for form, color and pattern. A visit to her studio, located in an 1801 millhouse, includes a tour of the historic home. Watch a video about Joyce and her studio. 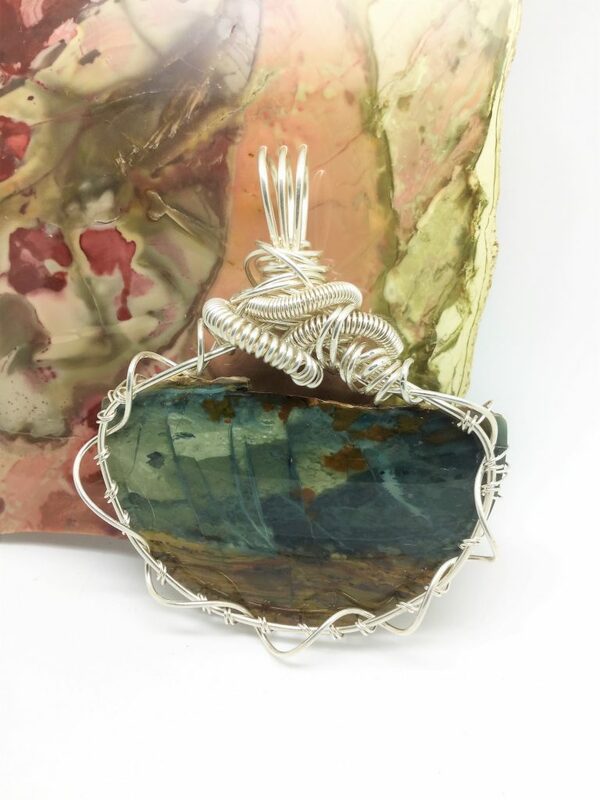 The original core intent of Bent Wrapped and Hammered was as an outlet for students of Linda Van Hart (Tollhouse Studio) to expand beyond the classroom studio to present their work for exhibition and sale. 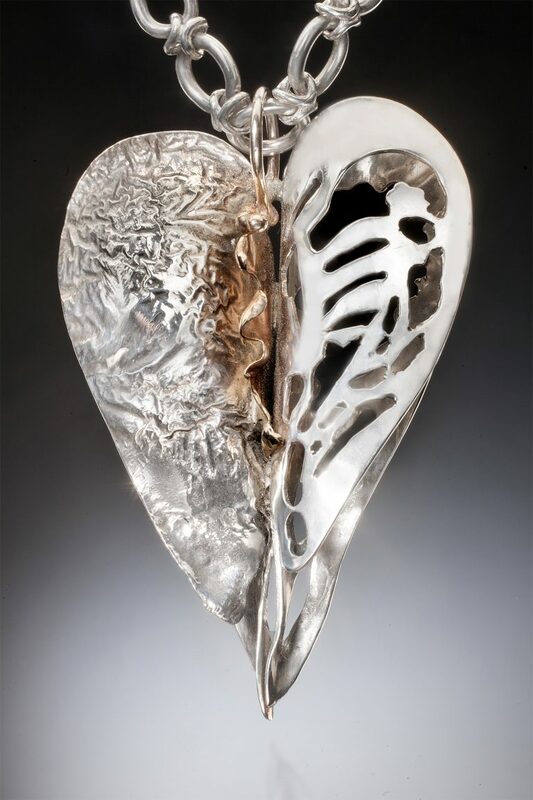 A few of the founding artists have moved on to start their own businesses and Bent Wrapped and Hammered continues under the ownership of Max Groft, one of the founding artists. Working with Linda and her students in the classroom facilitated the exploration of a wide range of tools, techniques, media and genres. 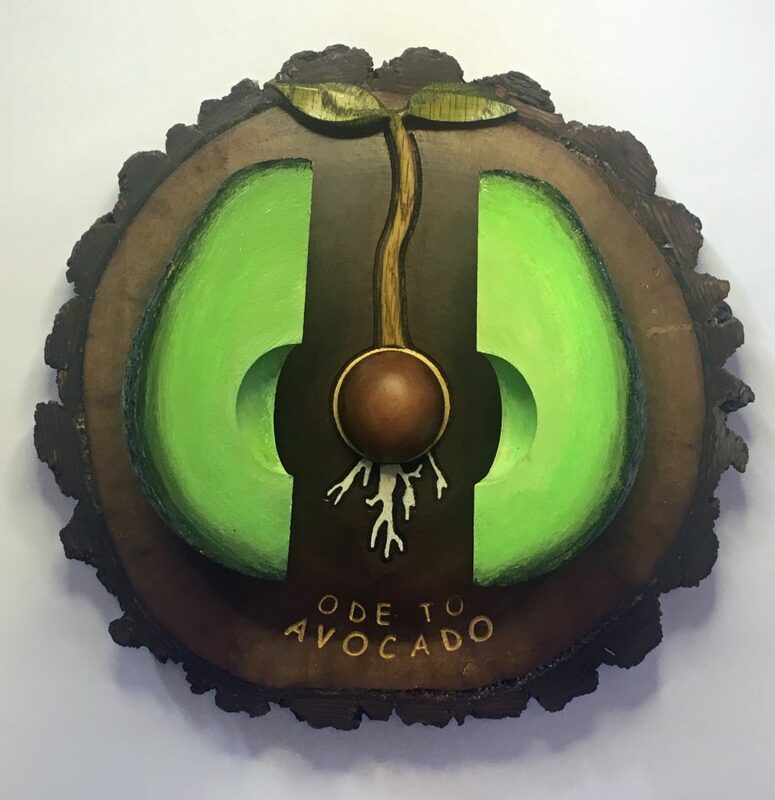 Max not only had the privilege of learning under artist Linda Van Hart, but after completing her courses, remained as one of her teaching assistants as well. Working in Linda’s classes for many semesters has taught her that she will always be a student. Watch a video about Max and her studio. Linda Van Hart sculpts botanical portraits. Rather than gems, surface texture and form are the focus. 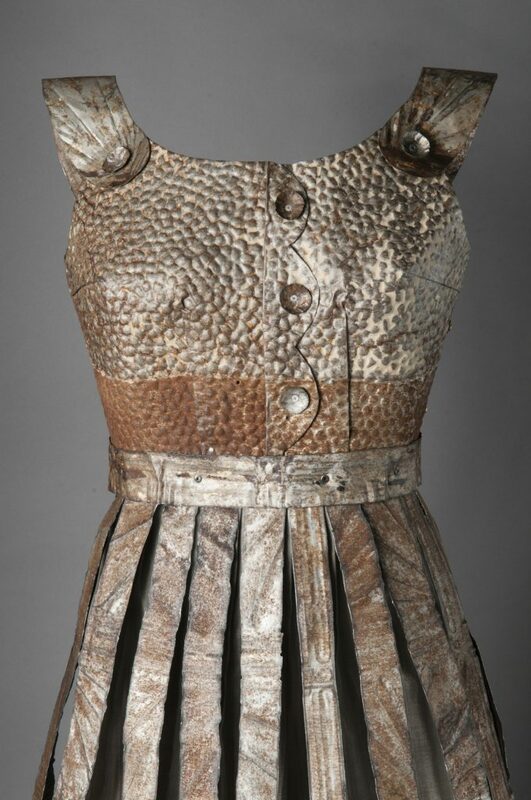 The scale of the work is dramatic but the fluidity of diminished diameter forging and undulating surfaces lend a rhythmic grace to the body adornment. 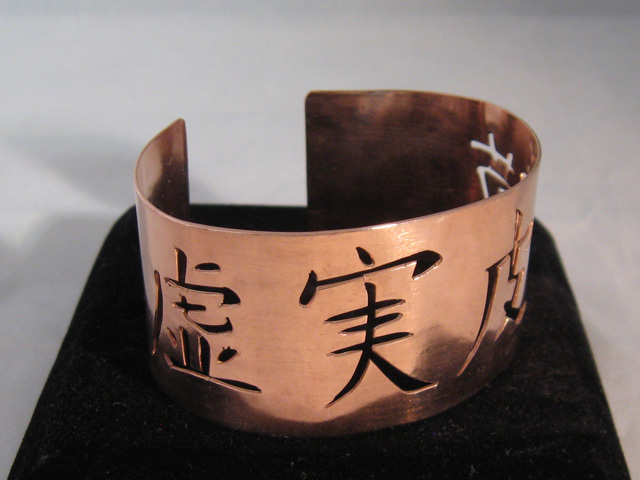 In business and teaching metalsmithing for over 30 years, Linda’s nature inspired work is easily recognizable. Watch a video about Linda and her studio. I was born in Salisbury, Maryland to parents who were both creative and artistic. My father’s love of water-foul-carving was the inspiration for my passion of wood-working. After graduating from Millersville State College, I located to Carroll county in the fall of 1981 to teach Industrial Arts. In the summer of 1990, I built my home in Silver Run. I have always enjoyed building, restoring and repurposing. Searching for old lumber, hardware and glass, I enjoy creating a variety of objects that are unique and functional. 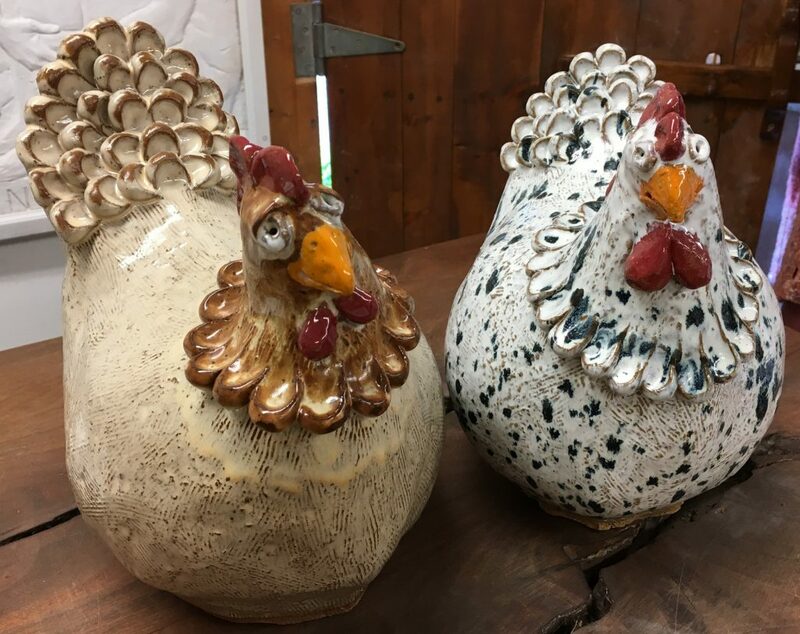 My store, Tom’s Cabin, is where I display and sell my creations as well as antiques, vintage items, and recycle Americana. Follow Tom's Cabin on facebook! Thomas earned his BFA in printmaking, and has been a master printer and teacher. He is currently a member of NOMA Gallery in Frederick and actively shows his work regionally. 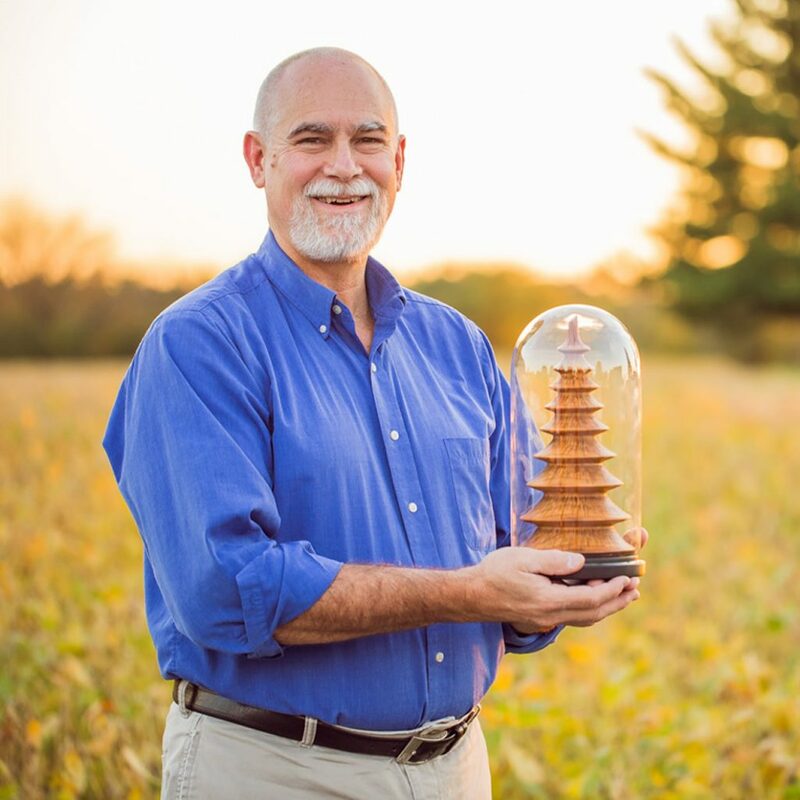 His studio and residence are nestled in farmland near Union Mills, where he is a full time artist. His goal in art-making is to make people smile and think. Watch a video about Thomas and his studio. I am a self-taught multi-media artist creating a wide variety of artworks and sculptures which I mainly sell at nearby art fairs. During the past year I created and installed two large Barn Quilt sculptures for the city of Westminster, one sited outside the Farm Museum and the other sited in front of the County Office Building. In June I will be publishing a book “Puttering Around The Art Studio” in which I share some of the techniques, art explorations, and insights gathered over my varied art career. The topics in this wide-ranging book run the gamut from simple instructions for making an umbrella ball and home-brewed gallery bags to practical topics such as how I create and decorate ceramic tiles and how to use an AirPen for acrylic painting. The book also includes a number of uncommon topics such as how to develop geometric sculptural ideas using SketchUp, and advice on how to take a creative walk around IKEA, home improvement stores, and craft stores. In addition to making art and writing, I also teach periodic art classes in my studio including MIG Welding, Acrylic Pouring, and Tile Making. Watch a video about Charlie and his studio. 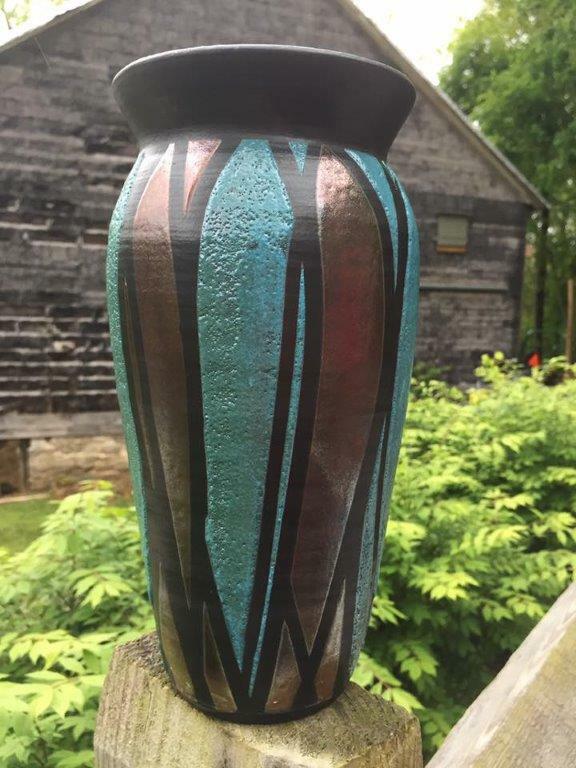 I am Ken Hankins, owner of Shiloh Pottery, Inc., located on our family farm in Carroll County, Maryland. I would like to introduce you to what is happening at the pottery. Please visit our web site and see the many pictures, projects and classes we offer. Shiloh Pottery was created in 1972 when my wife, Marty, and I returned to Maryland from graduate school at Alfred University in New York State. Over the years we have made stoneware pots, run a potters’ supply business, made and sold kick wheels, and fired salt-glazed pots with gas or wood. We have attended many craft fairs and shows, taught classes of all kinds in our studio, schools and colleges, and run workshops with famous and talented potters, all the time raising 2 children, Matt and Meg. On our web site you will see the classes we offer for kids and adults. Follow Shiloh Pottery on Facebook! Watch a video about Ken and his studio. I am a graduate of Towson University with a Masters in Art Education and have been an art educator for over 22 years, I am currently one of the art teachers at Century High School in Carroll County. I have participated in Carroll County Artists Studio tour for over 10 years as a guest Raku artist and demonstrator at Shiloh Pottery in Hampstead. Although I create functional pottery for the household, my trademark pottery is horse hair and peacock feathers delicately burned into pastel colored pottery. People come from all over to participate in the actual firing process bringing their own horse’s hair to commemorate their deceased horse or pay tribute to their living friend. I have also been included in the Gallery of Gifts at the Carroll Arts Center for three years and currently have work on display and for sale at The Clayground in Ellicott City, as well as, at the Off Track Art Gallery in Westminster. I participate in several artisan shows each year, Art in the Park and the Bethany Boardwalk Show. My work continues to be a sculptural critique of my day-to-day experiences. Working primarily in mixed media constructions, I look for the quiet beauty in ordinary, marginalized objects and their connection to a larger world. 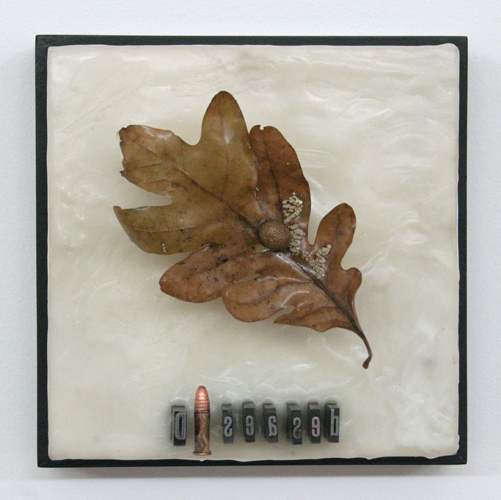 Recent artworks have grown out of decayed pieces of metal, bone, and other found objects which serve as metaphor for the society in which we live. 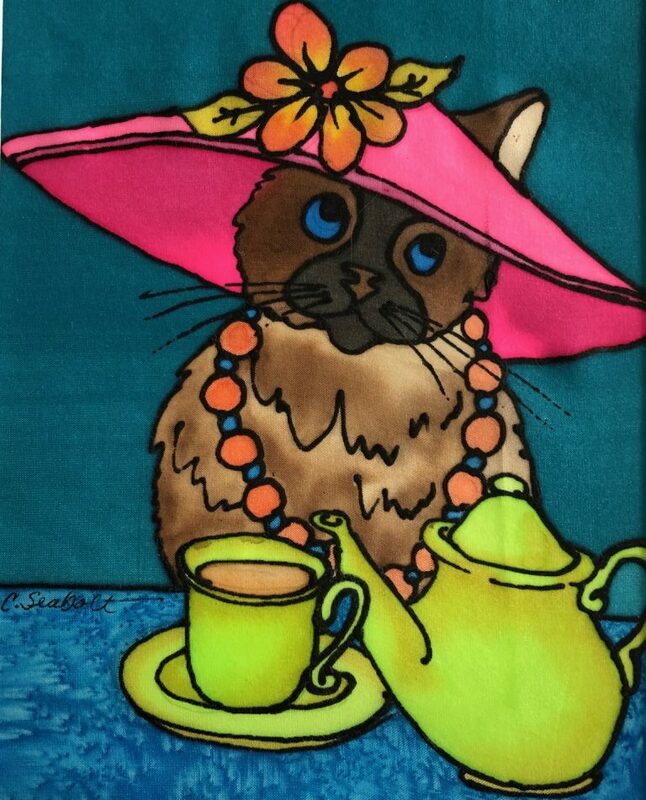 My name is Carolyn Seabolt and I create my art work at Cat Tracks Studio. I am a native of Carroll County and hold a BFA and MFA from the Maryland Institute College of Art. I have illustrated several children’s books and written articles for art education journals. I enjoy teaching and sharing a variety of different art techniques with students of all ages. If you are interested in classes please let me know. I work in a variety of media, my favorites being handmade paper, ceramics, silk painting and batik. 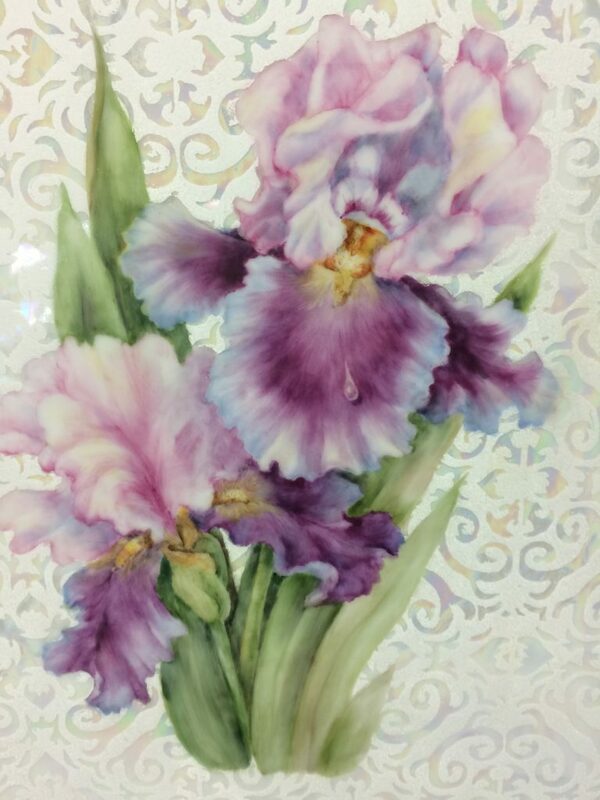 I also work with watercolor and create 1800’s style tinsel paintings My silk paintings and batiks can be found framed and also in wearable works of art. Most of my work has a feline theme, and because of the many gardens that surround the studio you will also find a lot of flora in my work. 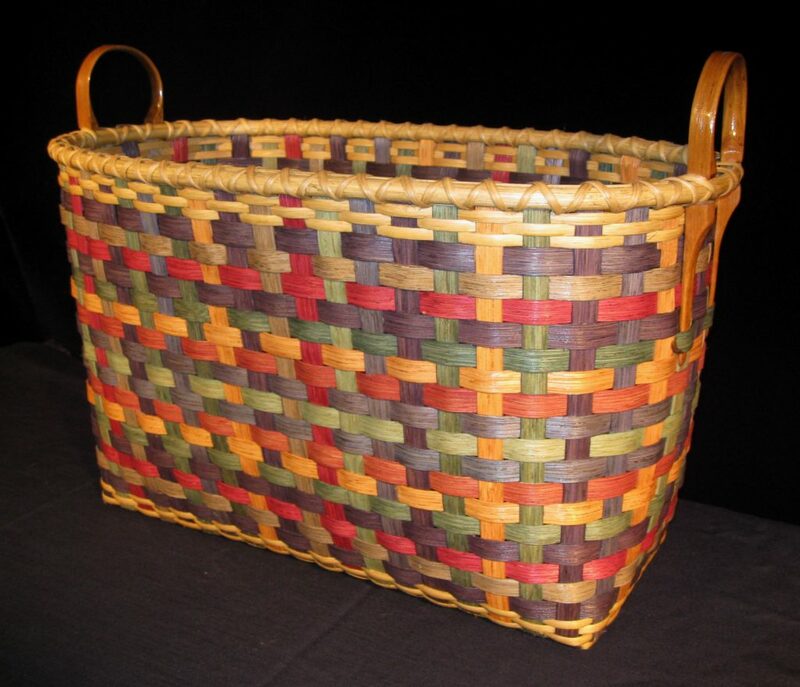 Sharon Schaeffer is a Westminster artist, teacher, and basketmaker. Her baskets reflect a blend of traditional and contemporary styles, techniques, and materials. Reed, ash, oak, pine needles, gourds, seagrass, beads, and found objects are used in Schaeffer’s handmade vessels. Follow Sharon Schaeffer on Instagram! Watch a video about Sharon and her studio. It gives me great pleasure to bring little creatures to “life” using just wire, wool and some needles. 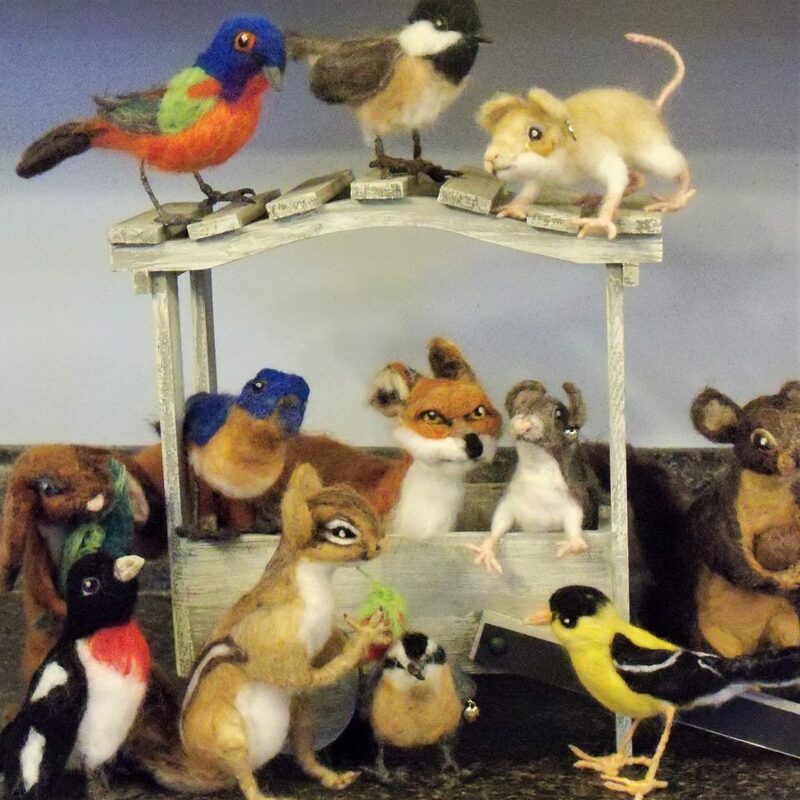 All my life I have wanted to have some creative outlet for the would-be artist within and I found it in the world of needle-felting sculptures of animals, and other figures. I have been needle felting for several years off and on and now consider it my business and my calling. 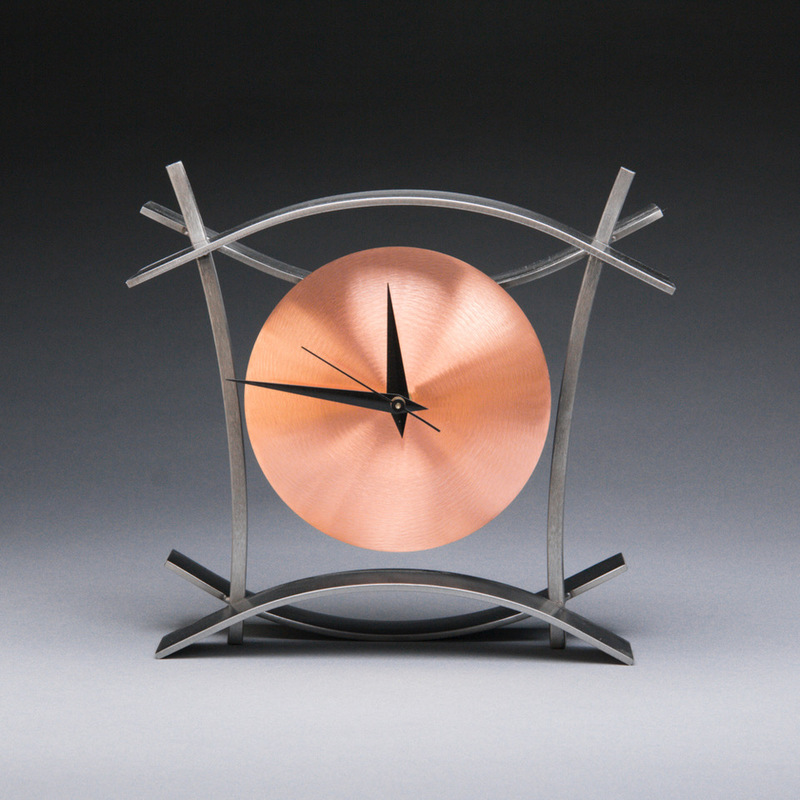 McCullough works mostly in steel and various metals and uses fashion as her creative springboard in exploring life. She like the duplicitous nature of steel which can be manipulated to appear feminine and soft while actually maintaining its strength and rigidity—an expression in contrasts and complements. Follow Donna McCullough on Facebook! Angela’s love of knitting and yarn led her to start raising sheep and spinning her own yarn. Angela loves creating unique yarns from her small flock. All of the wool used in her products are from her sheep or other small local farms. 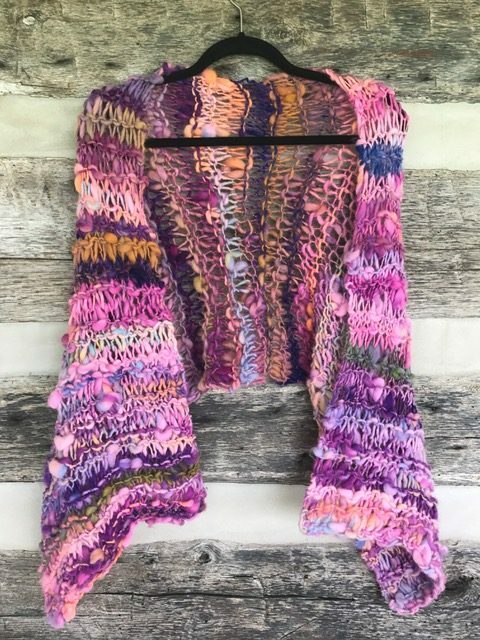 Follow Angellocks Fiberworks on Facebook! Hill Farm is home to Norwegian Fjord Ponies, Leicester Longwool sheep, various birds, dogs, cats, and chickens. Products of the farm include yarn, fleece, roving, sheep skins, lambs, hand-woven blankets. Raising lambs, foals, puppies, chicks, ducks, and kittens are all wonderful experiences to be a part of. We find this lifestyle, not necessarily easy but always rewarding. I can’t think of a better place to raise a child. Being in touch with the land, the animals, and the seasons give life a true sense of purpose. Follow Hill Farm on Facebook! Watch a video about Gwen and Larry and their studio. Preserving an Ashby tradition of three generations, we are rockhounds. We maintain a lapidary and design shop where we transform precious stones and minerals into jewelry. Many of the stones we like to work with are found in our annual travels to well documented collecting areas through the western US. Because camping in the desert is as much a part of the process as is running a rock saw or playing with wire, we have built a collection of material primarily based on where we like to go, so you’ll see a lot of things from Arizona, New Mexico, Oregon and Idaho. At our house, every rock has a story. Follow Ashby's Agates on Facebook! 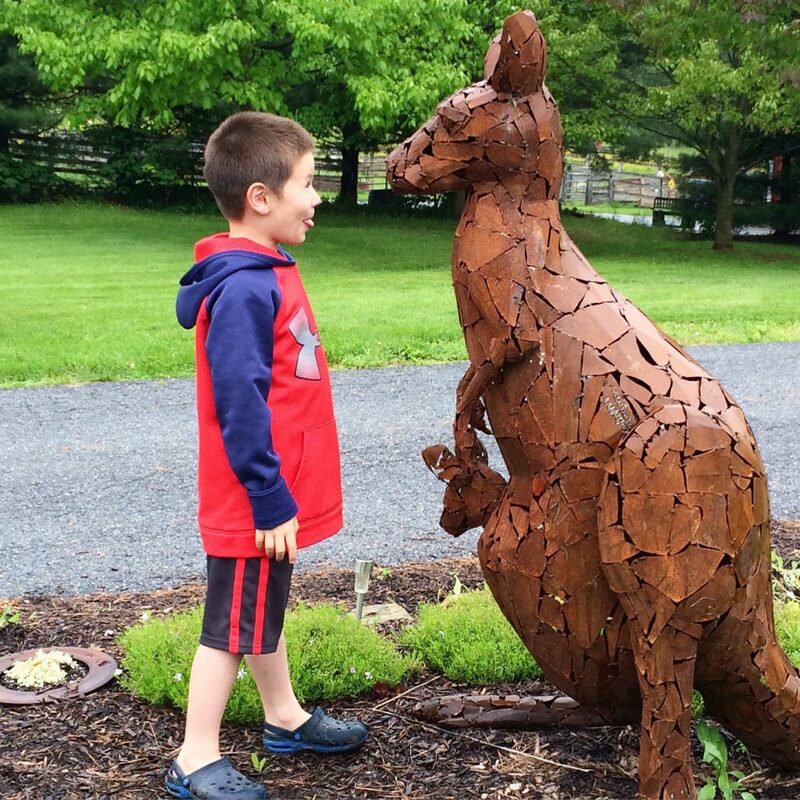 Imagine walking amongst several life-sized steel animals set in the landscape of a six-acre property in Carroll County. Stick your tongue out at a kangaroo or drink with a giraffe. 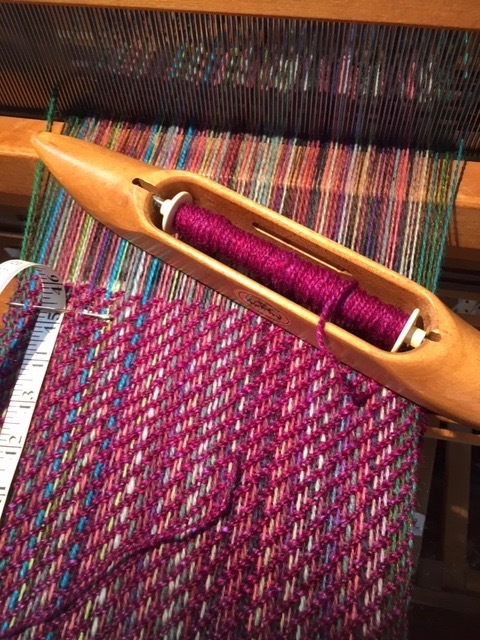 Stop into the studio and say hi to Virginia and see what she’s working on. Virginia recently completed The Great Blue Heron sculpture that is permanently installed at the main dock at Piney Run Park! Watch a video about Virginia and her studio. 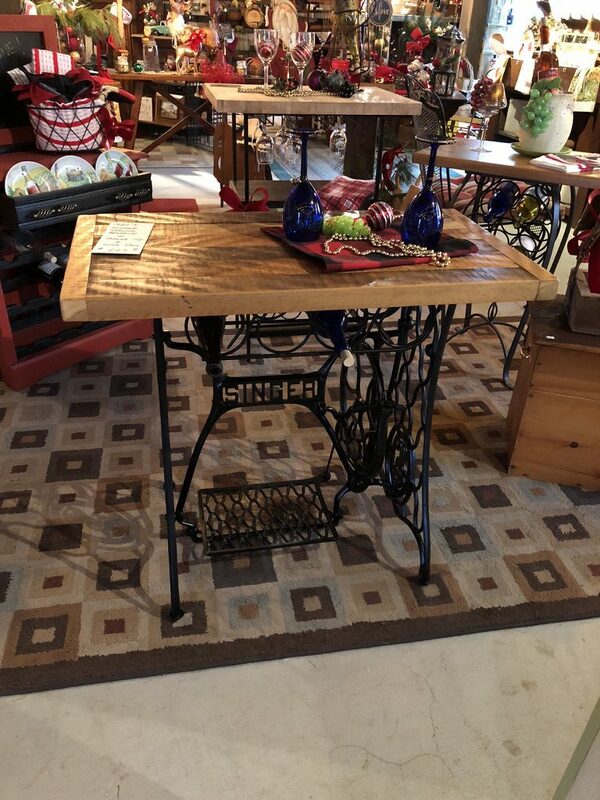 We specialize in Design for the Home made primarily of cold rolled steel and other amazing materials. All of our work is designed and handmade by us and one part time helper. As you can see, we are very prolific. Together we collaborate on all the functional and furniture design and construction. We love all things useful and beautiful, and are often inspired by both nature and architecture. We make our full time living by making the things we dream up and execute. Ken’s work has been collected by the DC Commission on the Arts and Humanities for their permanent collection in 2016. Julie was awarded her first public art commission in 2015 for the Canton Branch of the Enoch Pratt Free Library, Baltimore. We are also in the permanent collection of the US Embassy in Ottawa, Canada – eh.?.. We strive for perfection; hopefully get better over time and love getting to do this for a living! 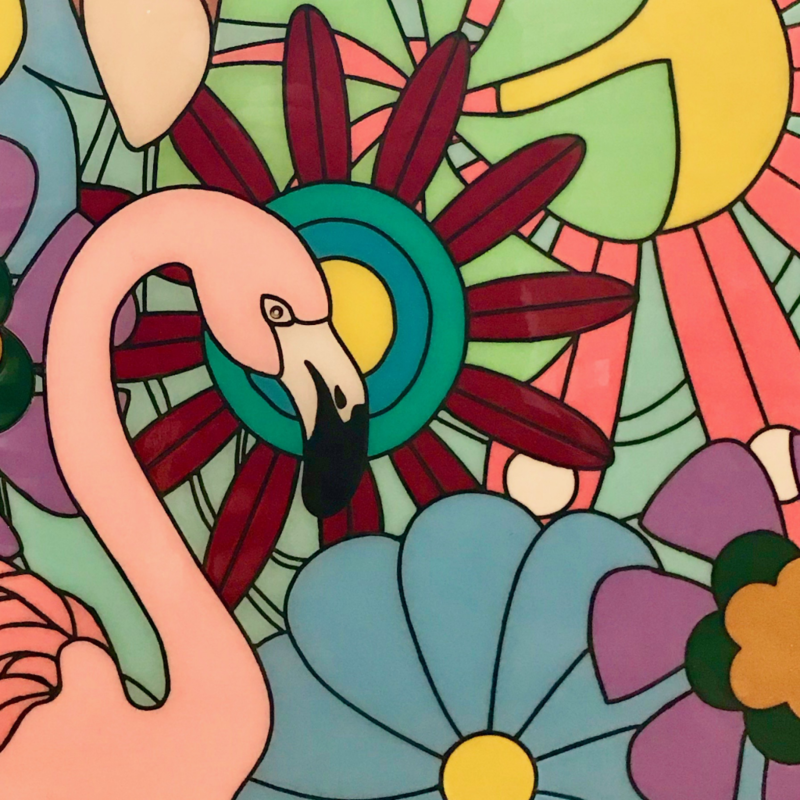 With over 40 years of painting and ceramic experience, Teri has become a talented artist and teacher. 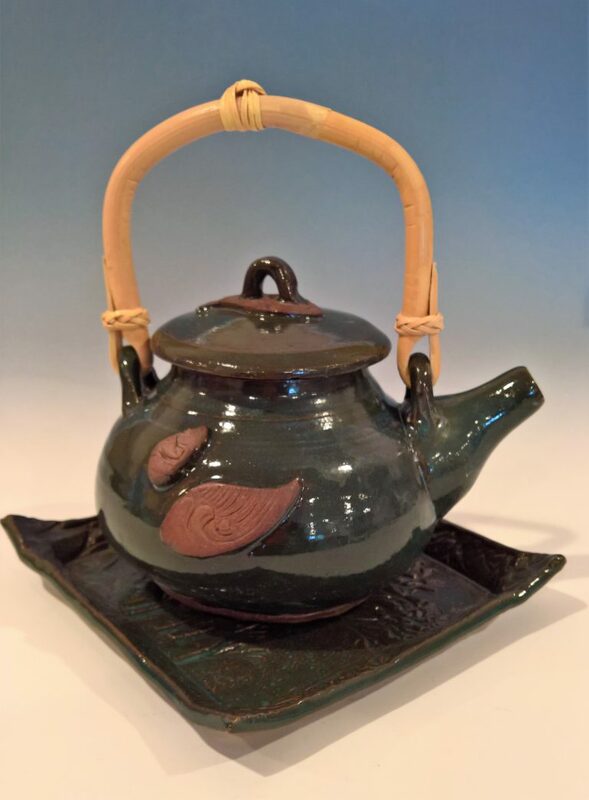 She has been certified through the International Porcelain Arists and Teachers Association as both a certified Master Artist and Master Teacher. Teri offers classes in and out of the studio. She has taught classes for home schooled children, scouts, and at the County Parks and Recreation Department. She also offers in-house classes at local retirement communities. Watch a video about Teri and her studio. Watch a video about Lori and her studio.